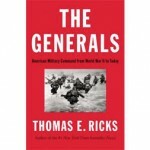 David chats with journalist Thomas Ricks about his new book The Generals: American Military Command from World War II to Today. This book examines the role of the General in the armed forces and how they react and adapt during war. While this book speaks of some of the greats like George Marshall, it also shows some of those who have failed at their job like the often lauded General Patton.